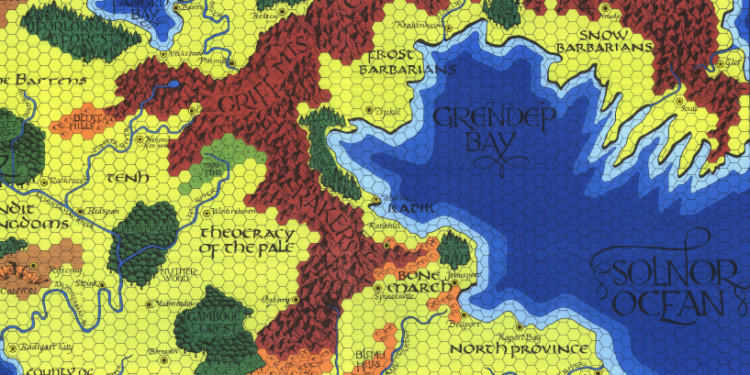 This week we delve into Knurl on the south side of the Bone March, north east Greyhawk. Notes about the region : Cold-temperate area, former state of the Great Kingdom. Various Humanoid tribes struggle and scheme for control of each area in the Bone March, the church of Hextor is the one ongoing presence in this land. 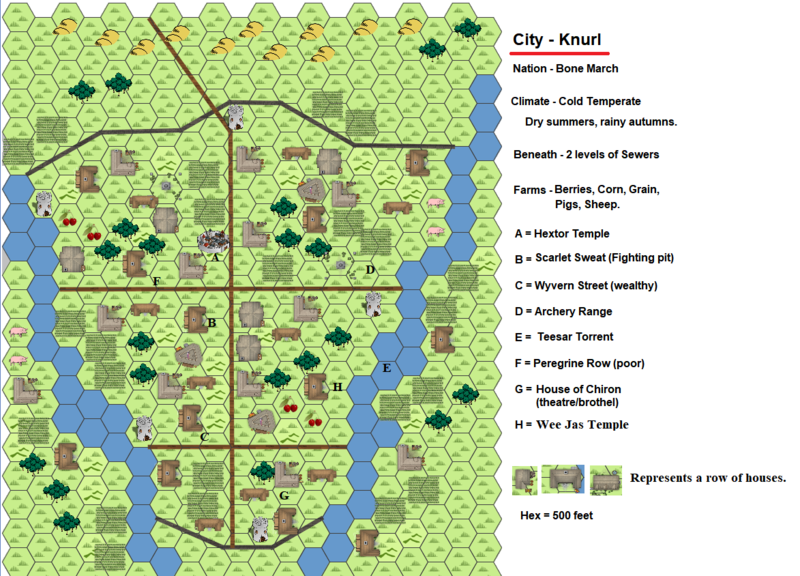 Knurl has around 13 thousand citizens, with several hundred Tieflings, many of which are refugees from The Great Kingdom and lands conquered by Iuz. The Bone March is not a safe place to wander alone, visitors should travel in groups and always carry a weapon. Knurl has muddy streets and bon fires during winter. Half the buildings are wooden cabins. Hextor church are bullies, and enjoy using force to threaten others into doing what they want. Guilds : Bloodtusk – Ork Assassin guild. Any job for coin or favour. Temples : Hextor, Kord. Wee Jas temple is behind a granary and not protected by the city watch. A hidden temple to Vecna lurks within Loftwood. Sewers : Knurl has been conquered, resettled and occupied several times in its history, and the sewers have many hidden rooms and secret chambers. Features : Wyvern Street – Well built stone houses, some are over a hundred years old. Fighting Pit (Scarlet Sweat) in summer and spring. Once per season they get a monster vs team event. House of Chiron-theatre/brothel. Guards are rough with anyone who doesn’t pay. Adventurer/Mercenary Recruit/Debrief location : Old arena on south side of town. 5e D&D : Warlock-Fey coven, agents of the winter court in the Feywild. Pathfinder : Witch coven, Mostly Tieflings. During they day they only gather in small groups to avoid focus of Hextor militia. Quest : two Dopplegangers (Shane and Sean) mess with the party to rob them of their shinies. Part 1-They act as PC 3 and 4 to ask PC 1 and 2 for cash for a present. Part 2-They act as PC 1 and 2 to Rob PC 3 and 4 (3 rounds then gone). Part 3-Rob nobles while acting as PC 3 and 4. Non-Combat Challenge – Convincing witnesses and nobles of the PCs innocence. Curve Ball – An Ork shaman dreamed of the youngest party member and seeks to challenge them. This fellow may be persuaded to assist them, for violence is not his first impulse. Recruiter/Reward : Library of Spinecastle, Reward is 150 gp each. Good reputation if they have any success. Quest : Locate and recover Dwarven lore and goods from lost Dwarven fort. There is a Wyvern in the area, and will be attracted to loud noises or spells, but can be driven off by acid or fire. Non-Combat Challenge – Cold snap in the mountains, must stay warm. Traps – Spear traps in several corridors. Curve Ball – Fort is not hard to find, but has some ghosts who want people to stay awhile. Stay forever. Recruiter/Reward : Greyfang Clan, Reward is a mansion (10 rooms downstairs, 6 upstairs) on north side of town. 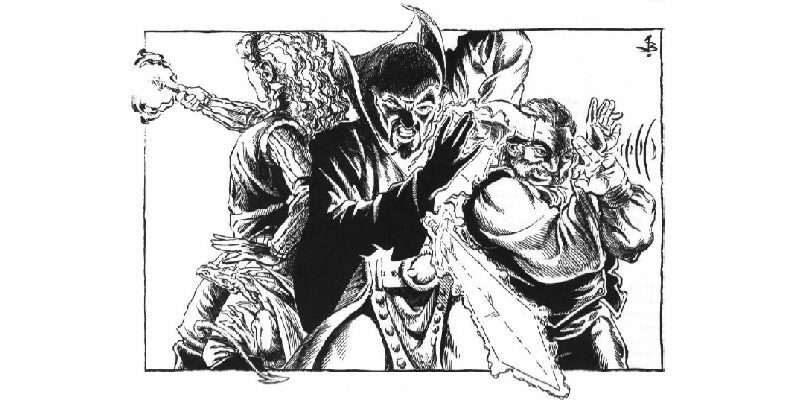 Quest : Stealth required-Recover son of Greyfang elder, kidnapped by Yellow Blade mercenaries for ransom. Non-Combat Challenge – Shadowwind Hobgoblins offer 100 gp each to cause a diversion that lets them take the son instead. Either Shadowwind or Yellow Blade bad guy has Stinking Cloud bead to make good his get away. Curve Ball – Otto the Archmagi wanders in, offers to trade a few potions or scrolls of minor value. If treated well he will warn them about Duergar sightings north west of town. Other creatures in the area : Needlemen/Blight-Unaligned, Spriggans-Mercenaries, Grippli-Against evil beings.